Queen Victoria in her Court Dress in 1854. She wears the Turkish Necklace. 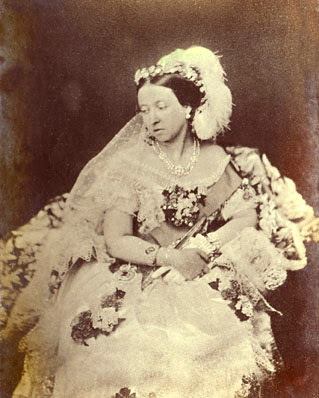 As mentioned previously, Victoria’s Turkish Jewels started out as a handful of loose diamonds given to her by the Sultan of Turkey in 1838. Prior to the occasion of her wedding, the Queen sent them, along with a Royal Commission, to Rundell, Bridge, & Rundell to be fashioned into the stunning jewels you see in the above photo. Resting at the back of her neck, the necklace begins with a large round brilliant diamond surrounded by smaller diamonds. On either side, linked by silver or platinum, rests a medium-sized round brilliant diamond. Descending from these magnificent stones are two sets of double-stranded diamond chains separated in the middle by even larger brilliant diamonds. 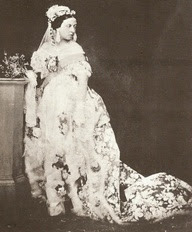 Queen Victoria, again in her Court dress on May 11, 1854. In this photo she wears her Turkish earrings. These double strands terminate on both sides with a diamond rosette consisting of 9 round brilliant diamonds, the center stone being slightly larger than the “petal” diamonds. From these rosettes, again symmetrically on either side, a pair of triple-strand diamond chains cascade down the neck, culminating in a larger diamond rosette consisting of one large center stone surrounded by eight petals. Four of these petal diamonds are the same size as the center stone, and they alternate with four slightly smaller diamond petals. It appears that a pear-shaped drop diamond was attached to the central rosette as a pendant. It is believed that His Grace, Prince Arthur of Connaught, inherited the necklace from his father Prince Arthur of Connaught and Strathearn, who inherited it from his mother, Queen Victoria.